In the previous post, Aloo Gobi, I had mentioned my experiment to apply the technique learnt in the cooking class that I took in making Indian crackers, failed. I had messed up on the proportion of spices and forgot to add oil, an essential ingredient! I was determined to try again since I really miss some of the crackers my mom used to make. She used to roll the dough really thin and then would cook it on the stove top by constantly pressing on the rolled out cracker on a hot pan with a kitchen towel. Basically, she was making sure that the steam generated from the heat would not make it puff up. After all the crackers were cooked, she would go on to make the world’s best garlic chutney. With this recipe, I wanted to recreate the taste of the crackers I grew up with but without the hard work! There are a variety of ingredients that can be used to make them and they are excellent tasting and healthy. Best of all, they are easy to make without the hard work involved in making it the traditional way. 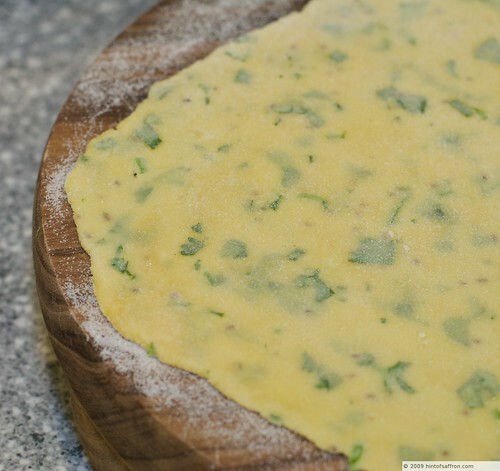 The key to making them is to roll them very thin with a wide rolling pin or a pasta machine if you have one. I have not tried with a pasta machine but I am told by my friends that you can control the thickness. I talked to my mom this weekend and asked her for the garlic chutney recipe. She could not give me the exact measurements since she does not measure the ingredients before making any dish! She cooks it based on experience. So I asked her for the relative proportion of the various ingredients used. Last night (a work night mind you! ), I decided to recreate the recipe by converting the “relative proportions” to proper measurements. I did not have one of the ingredients – dalia (husked, split and roasted split peas) and hence decided to substitute Chana Dal (chick peas) instead. Since chana dal is hard, it needs to be fried in little oil and then ground in a coffee grinder after it is cooled. Since I was rushing to make the recipe being a work night, without thinking I combined the Spanish roasted peanuts (soft) along with the chana dal (hard) in a food processor. Big Mistake! Peanuts obviously turned to powder way before the chana dal. After this mistake, there is no recovering from it. I tried to take small batches and grind them in a coffee grinder that I use for grinding spices. That did not help as the peanuts was starting to release oil already. Agggghhhhh! So, there is obviously going to be another round of trying to make the garlic chutney and this time it will be this Friday or on the weekend so I can concentrate and not rush. I will post it this weekend. You have to try the crackers with the garlic chutney since it makes a big difference in taste. Place a pizza stone in the oven (if you have one) or a cookie sheet turned upside down. Preheat oven to 350 F.
In a mixing bowl, process besan, rice flour, salt, ajwain seeds, cilantro and olive oil using your hands. Add the water and knead the flour for a minute or so. Let it rest covered for 10 minutes or so. 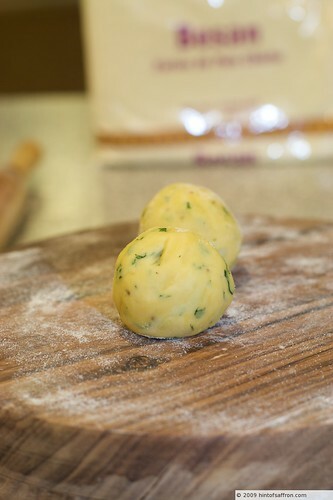 Divide the dough into 2 inch balls. Roll out the dough with a rolling pin as thinly as you can using the rice flour liberally. When the dough is as thin as possible, brush or dust the extra flour off. Prick the surface all over with a fork. 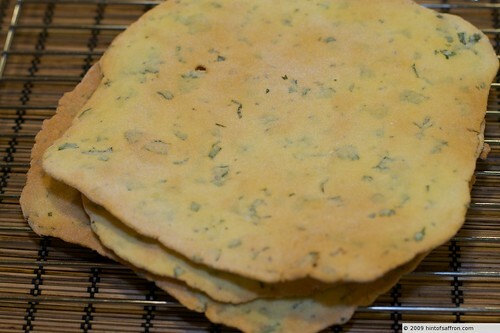 Slide the dough on to a parchment paper and slide the parchment paper onto the inverted cookie sheet or pizza stone. Bake for about 2 minutes. With a pair of tongs, turn the dough over and bake on the other side for 2 minutes. The dough should be light brown in color.